If you live in California and like to dine out with your dog, you’re in luck. Gov. Jerry Brown signed a bill yesterday that will allow dogs to join their pet parents in restaurants’ outdoor areas, as long as the dining establishments and local ordinances are into it. Many areas of California, including Los Angeles County, already allow doggie diners in restaurants’ outdoor areas. And some restaurant owners in not so dog-friendly areas have been letting canines join their two-legged customers, even though it’s illegal. The new bill will allow Chows, etc., to chow down in restaurants statewide, as long as health codes and local ordinances are followed. Dogs (with the exception of service dogs) will still not be permitted inside restaurants. They will be required to enter the outdoor dining area through a separate entrance. And there will be no wandering around and begging other diners for handouts — dogs must be kept on a leash or in a carrier, and won’t be allowed to sit on chairs or benches. The bill was introduced by Assemblywoman Mariko Yamada. It goes into effect Jan. 1. 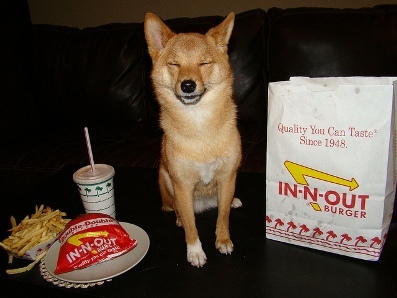 “With Governor Brown’s signature, restaurateurs in California will see more businesses catering to their customers and the canine companions they love,” Yamada stated in a press release.